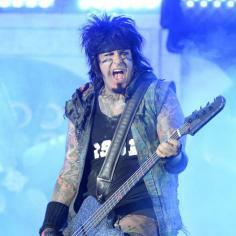 Mötley Crüe want to ''bow out with dignity'' after their final tour this year. The heavy metal band - made up of Vince Neil, Mick Mars, Nikki Sixx and Tommy Lee - announced this week they will stop performing live after a mammoth 72-date world tour in the summer. They have also signed a 'Cessation of Touring' document - forbidding them to use the band's name after the run of shows is complete. Discussing how the idea of a final tour came about, bassist Nikki told Rolling Stone magazine: ''It's been thrown around jokingly for some time. I remember talking to Vince in Japan, and the conversation came down to, 'How do we want to be remembered?' It really came down to figuring out how do we bow out with dignity. The farewell tour will begin on July 2 in Michigan and will continue across North America until next year when the they will head overseas. The musicians are currently putting together the stage set and deciding what tracks to play for the last time. Tickets for most dates go on sale to the general public on Friday January 31.